In 1499 the Swiss gained independence from the Holy Roman Emperor and expanded their territory by invading nearby areas. Around this time, Swiss mercenaries were the most sought after and feared troops in Europe. But in 1515 they were defeated by combined French and Venetian forces at the battle of Marignano. Realising that they could not compete against larger states, the Swiss stopped trying to expand and declared neutrality. Later that century, the Reformation led to religious divides within the country, but the Swiss remained neutral during the resulting religious warfare in Europe. 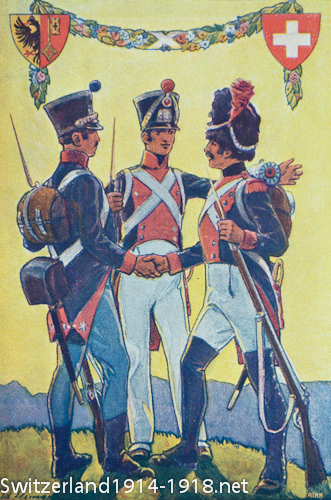 The French invaded Switzerland in 1798 and created a puppet state. After the defeat of Napoleon, however, Switzerland’s “perpetual neutrality” was guaranteed by international treaty. 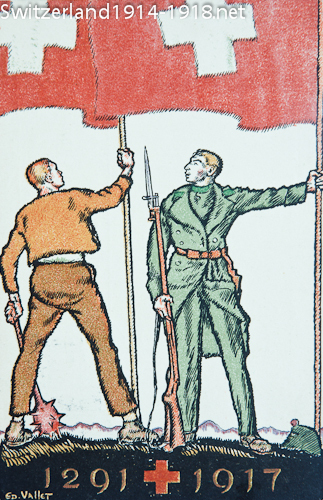 Above: A Swiss postcard from the First World War period. It associates the soldiers of the day (right) with citizens of 1291 who created the Swiss federal charter of that year, which formed the origins of modern-day Switzerland. Other patriotic postcards from the time referred to the Swiss folk hero William Tell. Before considering the First World War period, it is worth quickly summarising earlier Swiss history. The area that is now Switzerland came under Roman rule, and then that of the Holy Roman Empire (which also covered much of the rest of central Europe, from modern Germany down to northern Italy). In 1291, some Swiss regions united against the Holy Roman Empire, forming a defence league. Other cities and districts gradually joined the league, and this was the origin of the system of cantons: a loose confederation of administrative districts, comparable in some ways to US states, with no strong central government. In 1848, a new federal constitution was drawn up, which formed the basis for modern Switzerland, recognising 22 (later 23) cantons and establishing the capital at Berne. During the second half of that century, Switzerland tried (not always successfully) to keep out of international politics as much as possible. Above: A 1914 postcard marking the moment only 100 years before when Geneva had joined the rest of the Swiss confederation. The country was actually relatively young in 1914. The traditional date for the founding of the Swiss state is 1291, but it has been argued that the state was really founded during and immediately after the Napoleonic Wars. That was when Switzerland became a republic, rather than a loose union of cantons, and gained the first significant numbers of French- and Italian-speaking inhabitants. Click here to go to the next section on August 1914: the outbreak of war.